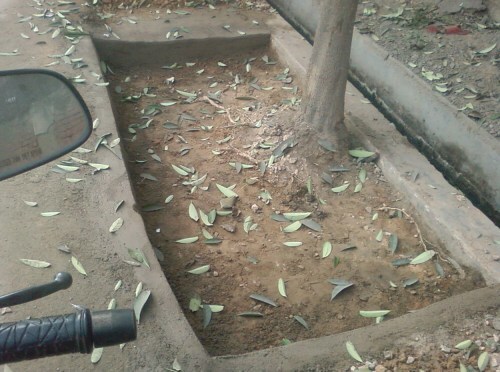 Here’s another tree dechoking success story we present as a model for the citizens of Delhi. After reading the blog posts, Trees Dechoked: GK-I Residents Show the Way Against Concretization, students of B.Tech (Biotechnology) at GGSIP University took upon themselves to save trees from concretization and old rusted tree guards that are generally planted along with new tree saplings for protection and are often left unremoved thus hampering the growth of the trees. The students had previously written to the authorities at the MCD and PWD for removal of concrete and old tree guards but no action was taken whatsoever. This was discouraging since although large number of rules and regulation for protection of environment and especially trees existed, no civic authority bothered to follow any of those. It was then that the students got inspired by the initiative taken by Padmawati Dwivedi around her GK-I residence and took to the RTI way. The students filed repeated RTIs and even took the case to the Central Information Commission (CIC). Along with the RTI, they attached all relevant rules and court orders notable among which are the Delhi High Court order of 2007, Delhi High Court order on 29th October, 2009, Ministry of Urban Development Guidelines 2000, Delhi Tree Preservation Act, 1994, Supreme Court Orders which clearly declare deliberate damaging of trees as an offense. The good work by the students clearly shows that where there is a will, there indeed our so many ways. Padmwati faxed the Chief Minister every day, asking for the implementation of Delhi Government’s very own orders. Students like Ankit Srivastava used RTI as a tool to make way for the greens in the sytem. With a little more thinking and some efforts, several other ways of saving the trees can also be thought of–in an attempt to save and secure our future and the future of generations to come. PrevHeroes of IEEE Appreciated on Earth Day! Well, if we can do some thing about cleanliness also would be add on to great work. we can do,for that also we can use RTI,in our area i have used RTI for fining shopkeepers n those people are regularly littering around,also the MCD people are now regular in cleaning and maintaining the area. Great work Ankit and also Padmavati! Gives me hope. I am fighting for the same thing in J-block of Chittaranjan Park and the going is tough with a lot of local clout, pressure, lobbies etc. coming in the way so no one really wants to do anything concrete while most seem to agree that what is happening is wrong. So for the time being it seems that since I am the one who is concerned about this mindless and indiscrimate tiling for parking os cars the onus of taking action is completely on me since trees and greenery do not really “belong” to anyone! I have tried the RWA route but that has not helped though they are ideologically with me. I was wondering how to involve students in this as well since I am no longer a student in the conventional sense. Any ideas? 1) file a RTI with refernce to that rule and ask status and implementation of that rule in your area.dont forget to mention all the rules and ask the official responsible for contempt of court. 2)FILE complaints in MCD or concerned authority office 3-4 times with the gap of 7-10 days and dont forget to take a recieved copy from them,involve RWA too for filing complaints,than complaint the matter in PUBLIC GRIEVIENCE CELL and attach all the complaint copies along with them.MCD Take action quickly when comlpaint is marked from PGC. name the officer in charge who is supervising implementation of ORDERS OF HIGH COURT & therefore responisble for contempt of court? the last date to deconcretise all trees is 30th may as given by high court. also i ll send u RTI which could be used in your case too. I would like to share with you my story about how I have made my contribution in saving the environment. My focus for the past 1+ year has been on removal of concrete around the trees from the roads. I am sharing details hoping that more and more citizens of Delhi will take up this cause with the authorities. If a single person can make different to over 600+ trees through 40+ complaints then imagine if we are able to create awareness in the minds of even a fraction of other citizens then there would be a great domino effect. To get the de-concretization done I have been actively pursuing with PWD and MCD for removal of concrete around the trees. For this purpose I have been doing surveys of various roads where this problem is noticed. Based on the survey I have been following up with the concerned authorities for taking action while going through their complaint system and then following up with the authorities. I had my share of challenges and success over the past one year. These authorities are mostly not actively doing the required de-concretization work and require perseverance and follow-ups to get this done. Some of the roads have taken more than 6-8 months and several complaints before they were resolved. Most of the time my complaints are closed without taking any steps towards resolution. However there are still few sincere officers esp. In PWD who understand this need and they also support when they can by making their staff take appropriate action. Facebook – You can search for “savetreesdelhi” on Facebook to access page where I have been uploading stories my mission. I would be happy to share experience & procedure with those interested in filling and following up with PWD and MCD. I can be reached at .